You are here: Home / Reading / What is Realistic Fiction? Realistic fiction is a story written about events that did not actually happen but could have happened; the people, events and places may be real. It is a classification of literature containing stories that could actually happen, in a time and setting that is plausible and contains realistic characters. Realistic fiction is created from the author’s imagination but uses historical events. 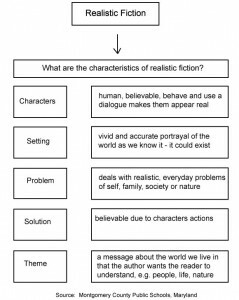 The following are characteristics of realistic fiction. Setting is an accurate portrayal of the world as we know it. The setting could exist; it is a vivid and accurate depiction. It contains believable stories as the writer uses everyday occurrences and/or extreme realism; the story is not true but it could be. Everyday language is present. The author uses a dialogue that makes the characters seem genuine. The plot contains conflict or tension as well as a resolution. The problems are realistic, e.g., problems of self, family or nature. The solution is believable as a result of the characters actions. The themes depict realistic experiences that the author wants the reader to understand, e.g., a message about people, life, nature or the world. The characters are human beings who behave in realistic ways. The characters use realistic dialogue that makes them appear real. The narrative structure and elements are presented in a time ordered sequence. Our school handed out this concept map to help students visualize the characteristics of realistic fiction. It offers some helpful notes regarding characters, setting, problems, solution and theme. Click on the image to obtain a PDF file.